Content - ADJ HEX IP Pars: With HEX LEDs and an IP65 Outdoor Rating Designers Can Create Any Color, Anywhere! 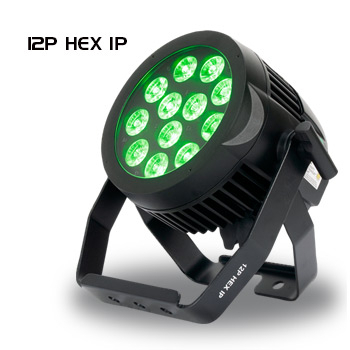 ADJ HEX IP Pars: With HEX LEDs and an IP65 Outdoor Rating Designers Can Create Any Color, Anywhere! Building on the success of ADJ’s popular 5P HEX, 12P HEX and 18P HEX, our new range of HEX IP Pars are designed to allow you the creative potential to deliver powerful and vibrant color washes in absolutely any situation. Combining flexible 6-in-1 HEX LEDs with rugged casing designs that are outdoor-rated, the new 7P HEX IP, 12P HEX IP and 18P HEX IP are professional pars that are ideal for a wide variety of entertainment lighting applications. Each of the new HEX IP Par models have heavy duty all-metal construction that makes them ideal for use in touring, event production and hire situations where equipment is continually transported, rigged and de-rigged. They are fitted with versatile dual yoke brackets that can be used for either variable-angle hanging or floor-standing. They also offer an IP65 rating and are therefore protected against rain, snow and dust, meaning that they are suitable for use on temporary outdoor events. IP stands for “Ingress Protection” The first number protects again solids, while the second number protects against moisture. The “6” means it’s dust tight, and the “5” means that the fixtures are protected against powerful jets of water. All three models feature powerful 12-Watt HEX color RGBAW+UV (red, green, blue, amber, white + UV) LEDs which allow for a huge gamut of colors to be created. These include both cool and warm white, for stage illumination, as well as UV-infused hot pink, lime green and electric blue. The inclusion of the UV element also means that the fixture can create the classic ‘black light’ effect that causes white and neon-colored surfaces to glow brightly. The LEDs are flicker-free, therefore suitable for filming applications, and offer an impressive operational life of approximately 50,000 hours. Put simply, whatever you need from your LED wash fixtures, the HEX IP Pars will deliver. A 30-degree beam angle makes them suitable for a wide variety of duties including stage washing, dancefloor illumination and architectural up-lighting and down-lighting. 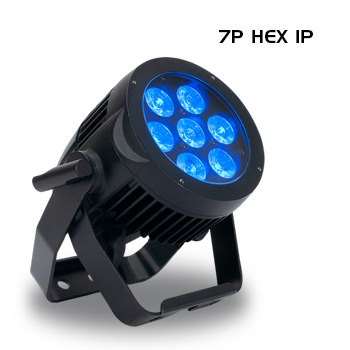 The 7P HEX IP incorporates seven LEDs, for a total output of 84W, and has a compact casing design that makes it ideal for situations where space is at a premium. The slightly larger 12P HEX IP features twelve LEDs, giving it a total power rating of 144W, meaning that it is suitable for situations were increased brightness is required but a relatively compact casing is also desirable. 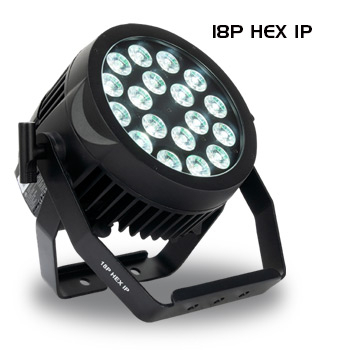 Finally, the largest fixture in the range – the 18P HEX IP – features eighteen LEDs, generating a potent total output of 216W, and is ideal for large events and applications that require extremely bright color washes. All three of the HEX IP Pars offer flexible operation with a choice of five different modes. A weatherproof four-character display and corresponding set of four push buttons on the rear panel of each unit allow for mode selection as well as configuration of the options for each mode. Static Color Mode allows any of the unit’s 63 built-in color macros to be selected quickly and easily for simple standalone operation, while the RGBAW&UV Dimmer Mode means that you can mix any combination of the red, green, blue, amber, white and UV LED color elements to create any specific color hue that you desire without the need for an external controller. The Program Mode features in-built chase patterns that can be set to run at a speed of your choice, while the Sound Active Mode runs in-built chase patterns triggered by musical beats detected by an internal microphone. Alternatively, the fixtures can be controlled via DMX, using a choice of four different control modes that utilize between 6 and 13 channels depending on the level of control complexity required for a particular situation. They are also compatible with the RDM (Remote Devise Management) protocol, which means that an RDM-equipped DMX control system can be used to set the address of the fixture remotely without the need to use the on-board menu interface. Using DMX control, the fixtures offer variable speed pulse and strobe effects as well as 0-100% digital dimming. They also offer a choice of five different selectable dimming curves suitable for a variety of different applications: standard, stage, TV, architectural and theatre. All three units feature outdoor-rated powerCON TRUE 1 sockets for power input and output (allowing multiple fixtures to be connected to a single power socket) as well as weatherproof XLR data input and output sockets. They can be used with waterproof power and signal cables, however, when the fixtures are used indoors, standard XLR and powerCON cables can be used. All four connections also feature rubber covers, which can be fitted to prevent moisture entering them when a plug isn’t connected. The HEX IP Pars are all professional-caliber fixtures, with extremely robust metal cases, yet all three units are still relatively lightweight and compact. The 7P HEX IP weighs 7.5 lbs. / 3.3 kg and measures 10” x 6.5” x 9.25” / 256 x 161.7 x 232.5mm (L x W x H), while the 12P HEX IP comes in at 10.5 lbs. / 4.7 kg and 11.75” x 7.85” x 10.5” / 298 x 199.5 x 264mm (L x W x H), finally, the top-of-the-range 18P HEX IP has a weight of 13.5 lbs. / 6.1 kg and dimensions of 13.25” x 9.25” x 11” / 336 x 233 x 279mm (L x W x H). 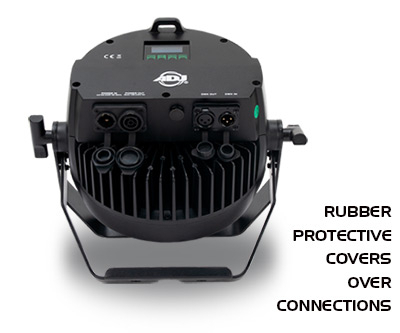 Combining extremely powerful HEX LEDs with tough weatherproof cases, the HEX IP Pars are ideal for use in production, rental and mobile event businesses where flexibility and reliability are essential requirements. If you’re looking for flexible LED par fixtures that offer an almost limitless color palette, impressive brightness, solid build quality and the ability to be used both indoors or outdoors in any weather, the 7P HEX IP, 12P HEX IP and 18P HEX IP are ideal contenders.